As we sat sipping beers and getting to know each other in the bar of the InterContinental Hotel in Addis Ababa there was an air of excitement tinged with trepidation of the adventure we were about to embark upon. We are small party of 6 lupine enthusiasts brought together by the desire to see the endangered Ethiopian wolf. 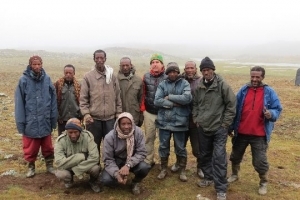 Fewer than 400 wolves remain in a handful of mountain enclaves, and more than half are found in the Bale Mountains. 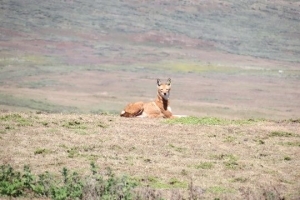 We were going to live with these wolves in the Bale Mountains as few other people have, other than the wolf monitors from the Ethiopian Wolf Conservation Programme, and the only way to access their world is to traverse the Bale Mountains on horseback and camp out in the wilderness. Yes, we were going to be riding and dancing with wolves. We were a privileged party who were going to enter the world of wolves with the help of Prof. Claudio Sillero – Director of the Ethiopian Wolf Conservation Programme (EWCP) and Liz Drake, our main carer and hostess from the organizers – Spencer Scott Travel. We were away in our 4×4’s as dawn broke as we had a long journey ahead of us and we needed to clear Addis Ababa before the early morning rush hour. The roads are surprisingly good (Chinese investment) but dangerous because of varying widths, no lanes and multiple usage – donkeys, goats, cattle, carts, school children and endless lines of people vie with huge trucks driven at breakneck speeds. 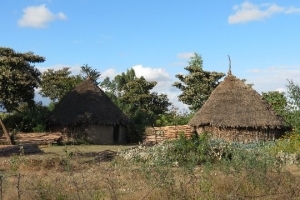 As we climb out of the Rift Valley and leave the lakes and volcanoes behind, the land becomes intensely agricultural and concrete dwellings give way to traditional straw huts. As the road leads on and upwards the air thins and the temperature drops. 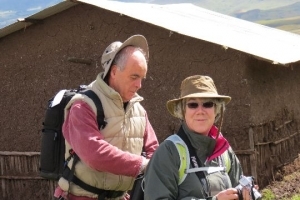 Finally we are above the treeline and in to Afroalpine meadows and the foot of the Bale Mountains, which are home to the wolves. 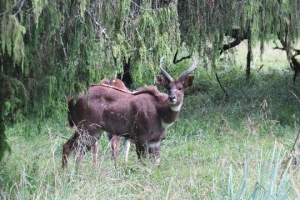 As we near Dinsho and the HQ of the Bale Mountains National Park we see our first Mountain Nyala, another rare endemic – a very majestic antelope. The rivers are fast flowing and the meadows are under water – clearly it has been raining very heavily for some time. As a result we have to abandon our 4×4’s, which were to take us up in to the Web Valley for our first 3-4 days. 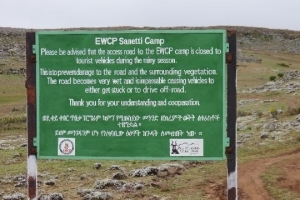 Our camp had to be abandoned too and so we overnighted at the Ethiopian Wolf Conservation’s HQ adjacent to the park gate. It was a little disappointing and threw our mental and packing preparations in to disarray. The following morning, with new plans in place, we headed to the outskirts of Dinsho where we bid farewell to our drivers and support vehicles and joined our ponies. 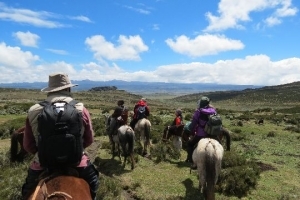 Taking to horseback from day one made for a tough start to what was always going to be a challenging traverse of the whole Bale Mountain range. We embraced the situation, caused much amusement to the local villagers as ponies were assigned and basic riding tips dispensed. Some of us were using traditional wooden saddles with blankets and rope bits, whilst others were trying out Claudio’s new (actually second-hand) leather saddles and normal tackle. You mount the ponies on the opposite side to in the UK and US and it is ‘western-style’ riding – easy peasy! Luckily Claudio is a very experienced rider, plus we had Burqa to help us all ease in to what was an unknown experience and alien environment and Liz’s re-assuring words, so we felt we were in as trusted and as safe hands as possible. Liz is not a rider (although she looked extremely competent to all of us) but has done this trip 4 times now and absolutely loves it, so we thought it can’t be that bad – as we set off our cook didn’t look like he shared the same confidence! By the end of the trek Guy was converted and excited by the whole experience. Madeleine also was embarking on a life-shifting experience that was way outside any comprehendible comfort zone. At 4000m and in an extreme wilderness environment we were all actually outside our normal comfort zones. The logistics of starting on horseback on day one meant we had to have our packhorses carry everything including a chocolate birthday cake Guy had baked for Molly’s birthday. Miraculously the cake had survived the journey on horseback and was intact when we arrived 6 hours later in camp. The efforts Guy had gone to were much appreciated and it was an exceedingly good cake. 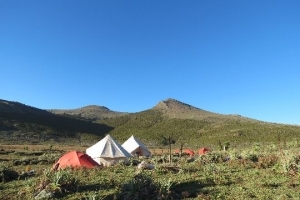 Camp was quickly set up next to the Sodota refuge hut that was built by EWCP and is used by their wolf monitors. This was done by Getwa our camp manager, Burqa, Alo and Ibrahim and his brother. We watched exhausted as these locals worked tirelessly. It was a slick operation – cooks tent went up, two toilets were dug and even a shower tent was erected. We had double and single expedition tents and settled into organising our gear before darkness fell and temperatures dropped. Energy levels regained as we gathered around the woodburner in the research hut and had tea and homemade biscuits. After a hot and delicious dinner we headed to bed with our hot bottles. It was cold in the morning but the rain had stopped and the sun promised to warm us all by mid-day. Without our 4×4’s, wolf watching had to be done on foot or horseback. Madeleine and Liz were both suffering a little from altitude and fatigue and rested in camp in the morning. Alan, Molly, Steve, Claudio and Alo headed off on foot to find wolf dens in the Web Valley with the hope of seeing the new pups. They returned after one of Claudio’s marathon walks (his enthusiasm sometimes exceeds he calculated distances!). They got close up to wolves but sadly didn’t see any pups. Refreshed after an al fresco lunch and time watching giant mole rats pop up around camp (the wolves main diet), Claudio, Alo, Steve, Alan and Molly headed off on horseback to cover more ground in search of other dens and wolves. Madeleine and Liz were still feeling a little fragile and decided to go out for a shorter ride later in the afternoon. Madeleine needed to gain more riding confidence and with just Liz and Burqa she felt more at ease and very quickly took the reins and bonded with her pony. They were also rewarded with one of the most moving and exhilarating wolf experiences (according to Liz) – they came across a lone wolf and sat watching it foraging less than 20 yards away for some considerable time. Then the wolf realised it was being watched and started howling to warn the babysitters back at the den. It was a very special and magical moment and wonderful to share it together. 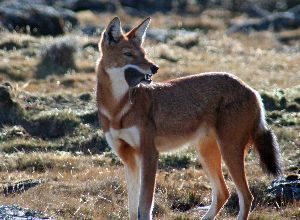 The Ethiopian wolves are stunning – they are red and white, slender and nimble. After a short while they felt they should move on and leave the wolf to foraging. As they rode away the wolf relaxed and stopped howling. They rode back to camp feeling totally elated – they had danced with a wolf and had as intimate an encounter as possible. That evening wolf tales were relayed as we sat around the woodburner, and we started to mentally prepare ourselves for the start of the big adventure ahead of us – the traverse of the Bale Mountains. 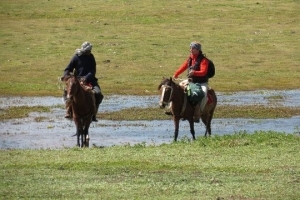 We wer e to spend the next three days riding between Sodota and the Sanetti Plateau. We’d be in the saddle almost all the way and on the move the whole time, setting up and breaking camp each day. This was to be a real wilderness expedition and experience of a kind none of us had attempted before. There was great excitement and anticipation in the morning as the gear was put on the load horses and our tents dismantled. When there was finally no trace of our two-night stay we were ready to head off. We needed to set a good walking pace as we had at least 6 hours in the saddle before we would reach the site to set up camp. It’s surprising how quickly you relax in to the saddle and trust your pony – these are sturdy and sure-footed mountain ponies. The terrain is rocky in places and the ground gives way when your pony steps on a giant mole rats burrow, so a fast walking pace is as much as you can do. We stopped every few hours to stretch our legs, have a snack and give the ponies a rest and drink. Alo and Claudio worked as scouts and covered much more ground than us. We would take detours and time out to watch wolves whenever they found them. When there weren’t wolves to watch there was always the magnificent scenery to enjoy. Riding in such a near-pristine wilderness and amongst such a dramatic landscape was exhilarating. Nights under big open star-lit African skies, getting warm around the camp fire (we took our own sustainable firewood), listening to the echoing screeches of rock hyrax, hoping to hear the cough of a leopard and the howling of the wolves, waking to sparkling frosty mornings, taking early dawn walks to dens and watching wolves greeting each other was awesome and humbling. Learning about the work EWCP does to save these beautiful wolves and the daily challenges they face, and the sheer dedication and resolve of Claudio and his team – Alo, Muste, Edriss & Zegeye is what makes this trip a lift-shifting experience and one of the most meaningful wildlife experiences you can have. 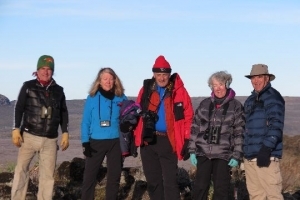 In addition to what we personally got out of the trip, in participating, we were helping financially to support the work of EWCP and the sustainable future of the Ethiopian wolf. 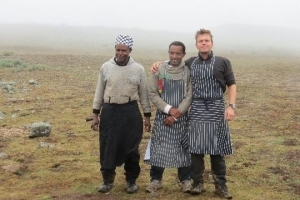 We felt sad and emotional as we said our goodbyes to the wolves, to our wonderful cook and other camp staff and the whole EWCP team and headed back to Addis and our everyday lives. 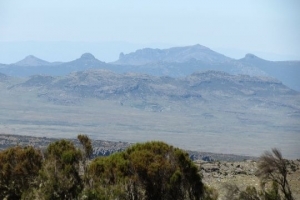 We had all left a little of our own hearts in the Bale Mountains and Ethiopia. To share similar experiences with Claudio and Liz see the next wolf watching trip they have planned for this November.